The OECD, a Paris-based think tank, has criticised Russia for pursuing oil company Yukos through the courts and pushing it to the brink of bankruptcy. "It is clearly a case of highly selective law enforcement," the OECD said. It added that the courts and prosecutors are "highly politicised". Yukos, which produces one of every five barrels of Russian crude, has until midnight to settle a $3.4bn tax bill. The company faces going bust should it fail to pay up. Shares of Yukos jumped 20% in Moscow on speculation that Vladimir Putin's government and the company may be able to reach a last minute agreement. Despite President Putin's pledge not to destroy Yukos, many analysts say its taxation woes are part of a politically motivated campaign against the company and its former chief executive Mikhail Khodorkovsky. 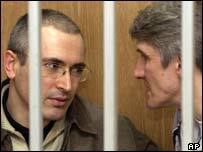 One of Russia's richest men, Mr Khodorkovsky is currently in jail facing a trial for fraud, tax evasion and embezzlement. The trial is scheduled to restart on 12 July. The OECD, or Organisation for Economic Cooperation and Development, is scathing about the motives behind the investigation. "The courts are often subservient to the executive, while the security services, the prosecutors and the police remain highly politicised," the OECD said in its annual economic survey of Russia. "The so-called 'Yukos case' reflects these problems." The OECD went on to say that the charges levelled against the Yukos and its executives could be "directed against hundreds of companies, and charges of tax evasion against millions of companies and citizens". 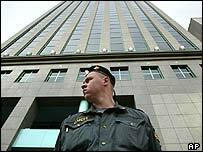 "Nor is the Yukos affair unique: similar legal campaigns have been directed at other businessmen in conflict with the authorities at both federal and regional levels." Yukos's current $3.4bn tax bill applies to 2000, when Russian authorities claim it misused tax havens to reduce its tax burden. The oil giant denies any wrongdoing, claiming instead that the practice was legal at the time. The company has also received a tax demand for a similar amount for 2001. On Tuesday, Russia's deputy finance minister Sergei Shatalov said Yukos may get more time to pay if it makes a formal request. But Prosecutor-General Vladimir Ustinov clouded the issue by stating that Yukos could still face additional tax bills for the years 2002 and 2003. The battle between the government and company have helped lift crude prices and hammered shares. Yukos stock has tumbled 50% since April, prompting outrage among investors. On Wednesday, investors seemed to be predicting better times. At 1400 GMT the stock was up 20%, trading at 239 roubles on the Micex index and $8.25 on the RTS exchange. Helping buoy sentiment was Mr Khodorkovsky's apparent willingness to give up his stake in the company. His lawyer, Anton Drel, said he had "long been ready for talks". But Mr Drel denied a report in the Financial Times saying Mr Khodorkovsky had written letters to the prime minister and finance minister, offering part or all of his 44% stake in the company to settle the dispute. Yukos, meanwhile, says its fate is in the Russian government's hands, since a freeze on its assets means it cannot pay the tax bill. In the US, shareholders have filed a lawsuit claiming that the company violated securities laws by evading taxes. According to Darren Robbins of San Diego law firm Lerach Coughlin Stoia & Robbins, which filed the suit, the complaint alleges a "two-fold fraud". "One is misrepresentation and the other is use of offshore entities to manipulate their financial statements, both of which had the effect of artificially inflating the price of Yukos securities," he explained on Radio 5 Live.